Manufacturing of a range of lubricating and specialty chemicals for industrial, automotive and marine applications under the group's own brand names. Trading of base oils, additives, chemicals and some related 3rd party products. Franchising which includes trading in raw material for products under the company's brand name. Having a P/NTA of 0.74x may not be spectacular but I would like to highlight a few things. The first is that the balance sheet is pretty clean and liquid, with net cash of S$20M (1H2014 Results) or S$0.12 per share. This compares quite favourably with the current market price. Secondly, a close look at the statements shows Associates contributing about $650K to the bottom line while it is booked at $2.9M. If a knowledgeable businessman were to buy this part of the company, I believe they would probably pay at least 7-8 times of its earnings (i.e. about $5M). Lastly, management is able to grow its book value consistently at a compounded rate of >10%/year since 2002 when the statements are available. Statistically, we see that the earnings and free cash flows are on average, relatively stable and consistent. As alluded above, the trailing ROE is 10.9% and has decreased significantly from 22% in ’09. However, if we adjust for the low returns due to the huge excess cash horde, it should be higher (we estimate it to be in excess of 14%). The company pays out 10-20% of its earnings, giving a relatively mediocre yield of about 2.5%. The only consolation is that the company has been paying dividends since 2010. Now, we're no genius in the petroleum lubricating or specialty chemicals industry. Much of the qualitative aspects of the company should be reflected into the financials. Since there’s no easy way to ‘quantify’ its quality, our main concern is whether or not we can count upon the company to remain in business like it has before in the foreseeable future. Other than the usual risks like fluctuation of raw material prices etc (which AP Oil has proven to manage quite well overall and our guess is that the current low oil price bodes well for its bottom line), the key business risk is the concentration of its major customers. The top 2 customers contributes about 40% sales in 2013 and the top 3 about 59% sales respectively in 2012. This got to be a big minus. As a sort of counterbalance, the company has plans to grow market share in existing markets and foray into untapped new territories. Hopefully, this will introduce both customer and geographic diversification. With its strong financial position and experience, AP Oil is well poised to take advantage of further expansion opportunities. AP Oil is likely to enjoy regular recurring sales from repeat clients. Firstly, the lubricants and blended chemical are expendable products and secondly, it is hardly ‘postponable’ (i.e. once it’s being used up or expended, they need to replenish it pretty soon). Also, our guess is that for some applications and clients, these products form a small part of their budget and it is quite unlikely for them to actively source for another supplier. Lastly, some products are non-standard and require certain R&D and technical know-how. When a customer orders a product to meet specific requirements, R&D is required to develop a new formula to meet these requirements. Note that AP Oil will retain ownership of the formulation which builds on its existing knowledge and database. In some cases, customers provide sensitive formulation owned by them (which may be sometimes a positive too in terms of customer retention). It seems that AP Oil is a pretty solid business with decent assets backing. Is the company undervalued relative to the market price now? As mentioned, AP oil consists of 3 segments. The financial reports separated their individual revenue and gross profit contributions (all 3 segments are still positive here) but lumped all the expenses together. Thus the best way to value the company is by considering the whole. With its predictable & stable results, it is not hard to have a conservative earnings power estimate for the company of about $4M, which is lower than the past 5 years as well as the TTM results of $4.5M. Despite having a relatively simple business model, nice track record, potential for growth and strong financial setup, I hesitate to give a high multiplier due to some key risks I’ve discussed earlier (I'll probably touch more on that in my future post). A 9-11x multiple should be good enough. Adding to our $12M estimate of net excess cash, the valuation becomes $52M or $0.315 per share. Comparing market price of 0.191, we have an upside of 65%. Of course, this is just a very simple but in our opinion, quite reasonable valuation process. Although we did test this with other valuation models (which coincidentally gives an intrinsic value range of between $0.25 - $0.35 which reinforces this estimate of $0.315) I think this is good enough. As long as the estimate is sensible and conservative, coupled with a huge margin of safety, there’s no need for an accurate figure. It’s better to be approximately right than precisely wrong. Insider ownership is pretty high at about 50% and the management should care enough for the business to do well. The question here is do they own too much to ignore outside minority shareholders? With a long operating track record, potential for growth, coupled with a price that offers sufficient margin of safety, we decided to take a position in the company. Sure, the business isn’t the best of the best but a purchase at this low price should be well justified. It's not easy nowadays to find a relatively good ROE company with low valuations. If one can find 10 companies like this, the diversified result should turn out quite satisfactory. Very nice and detailed analysis. By the way, what is your buying price? Hi Richard, thanks very much for your positive comments! My average price for AP Oil was just below $0.2. Although the price has since dropped slightly, I feel the fundamentals are still intact. There may be no obvious catalyst in sight but i'm taking a long term view for these and things have worked pretty well so far. What about you? I've read your CNAV analysis and IIRC, it should be close to your target price now. I must apologise that I miss this post before your email. 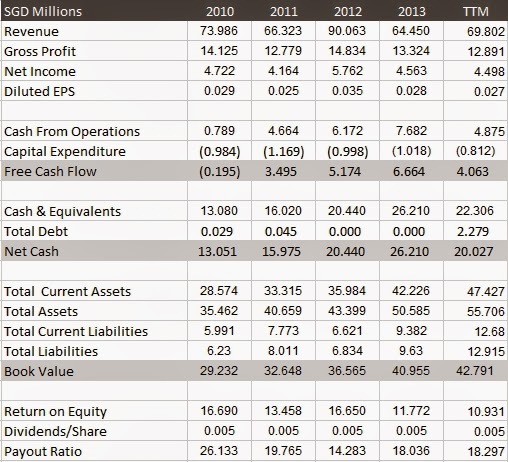 It is so well analyze in terms of financials. Because of your introduction, I am going to research on this company. Stats wise you did a great job already for us. I will be very, very interested to hear from you about your thoughts and evaluations regarding this company. You can either email me (secretinvestors@gmail.com) or leave comments here. Thanks very much! Can you share about how you arrive 9-11x multiple? AP Oil has a stable, predictable and cash flow generative business. Coupled with its huge asset backing and low leverage, it is not hard to believe the company will remain in business for the next many years ahead. In my post, I estimate that the company can at least maintain an average of about S$4M in earnings annually in the long term. Using a simple 10% discount rate for the company (without factoring any growth), it essentially gives a PE of about 10X which I thought is a fairly conservative estimate. Although the company's current PE in the market is about 6-7X, I thought 10X is not unreasonable considering its fundamentals. Also, if you back track to the past years (2004-2005 period and 2007-2008 period - although there may be some other reasons for part of the price increase), the company's PE did went as high as >15-20X and that occurred when their financial position wasn't as strong as it is now, further giving me some level of assurance that my estimate is not way too excessive. Both you and ValueEdge are very generous on your reply, I will never know this stock without your blog. And I was about to jumped in upon reading both blogs without further analysis. Anyway, I have re-looked the stock once more and decided to forgo it, as I can find better stocks with better MOS at the moment. Simply, I think my method of valuation is different. I focus a lot on Net Asset, of which I discount the assets on balance sheet accordingly and compute the F/V. The F/V I got simply doesn't provide attractive MOS for me to own the stock. Back to your point, please correct me if I’m wrong as I don’t really know how to compute F/V based on P/E. You assign a P/E of 10, do you subscribe the idea of the % of growth = P/E i.e 10X means 10% growth? You mentioned about based on 2000 to 2008 >15-20X, so 10X is reasonable of which I agreed. By the way do you have any experience to share about how you go about it where net asset based valuation differ greatly from earning based valuation. I read the annual report and I have to agree with you most of the points. But trading volume is really low, which means difficult to buy or sell. Thanks for taking the time to go through the annual report. Glad that you agree with me on most of the points (please let me know if there's anything that I missed etc so that I can have a better understanding :)) Also, you are spot-on about the low trading volume. This is very likely due to it being neglected by investors/speculators and also the low number of outstanding shares available. Typically, I'm fine with holding on to such stocks despite its low trading volume as long as it is substantially undervalued and pays some amounts of dividends every year. Also, my personal experience is that when people start to appreciate the company's true value, the volume will increase greatly with the price - that is usually the best and easiest time to take profit. I guess you must have some unhappy experience with low volume stocks. Care to share more about it if any? No unhappy experience on trading vol, just that it makes buying and selling more difficult. anyway that will change when it becomes more noticeable. By the way, do u happen to know their main clients and also competitors? Good to know how they benchmark to their peers and what is their market share like or competitive advantage of how they win their business? Their clients in the specialty business are typically MNCs that re-export these same products to other companies. Manufacturing and trading business are marketed in several countries. I understand why the management does not disclose who their main clients are. Customer concentration presents significant risks for the company although AP Oil intends to expand further organically & through acquisitions. The recent acquisition of Heptalink should bring about some benefits in terms of tapping into more markets. Also, mentioned in my post, the nature of its business should bring in some long term repeat customers. Its not easy to find direct competitors with AP Oil listed in SGX. The closest I find is Chemical Industries which personally I feel is not as financially sound as AP Oil. Do you happen to find any competitors that we can look into? AP OIL delivers fairly good results as announced today. Just curious how do you spot the counter? I m skeptical on small cap and penny stock. Yes, agree that AP Oil delivered fairly good results that are within expectations. Unfortunately, management did not increase dividend payout which I feel they can easily afford given the huge cash horde and strong earnings power. With regards to how I spot the counter, a couple of readers asked the same question. You may want to refer to the link here for more details. What I can say is that it requires a bit of hard work and being able to identify a potential purchase when you see one. To be honest, I always begin my research with a fair degree of skepticism to most stocks (and that includes blue chips as well). Even after my own analysis and purchasing the shares in the company, there will still be some level of uneasiness. Things like these always pop into my mind - Are the financial statements reported fairly? Have I done enough research and understand the business well enough to justify a purchase? Are there other factors that may affect the business that I am not aware of? The only way that I feel can address this issue is to 1) Do our own diligence in research and analysis, 2) Ensure the price purchased is not too excessive and 3) Diversify adequately to minimize unsystematic risk (so that one mistake will not affect your portfolio too much). These are further elaborated in my post on Our Stocks Investment Philosophy. How's your results in investing in non-smallcap stocks? Would definitely be interested to hear from you :-) You can email me at secretinvestors@gmail.com if you think is more appropriate. AP Oil Management marginalizes OPMI with low div payout and high pay to themselves. Critical facts why not to invest in this company. Thanks for your comments regarding AP Oil. I'm aware of the low dividend payout and management's high pay and I did put some thought about this issue before making an investment in its shares. As far as I know, a low dividend pay out and high pay are not indications of fraud or the like which would certainly make me reconsider. The company has been consistently paying dividends for at least the past 5 years (although relatively low at about 2.5% yield) so I wouldn't consider this as an extreme case of marginalizing OPMI. Yes, the management is overpaid but I don't think this reason is enough a case to totally avoid investing in its shares. We can't deny the fact that the financials of the company are still rock-solid. Management also has clear-cut plans to seek expansion in its core business and has clearly taken active steps towards realization as seen in recent divestments/acquisitions as well as its entry into the Chinese market. The company is flushed with cash and negligible debt and these not only can help AP Oil tide through unforeseen circumstances but also create many possibilities for management's plan to come to fruition. Considering the potential growth of the enterprise and that the price then was low enough and balancing these with some of the black marks (which always exists in any investment thesis), I still think a purchase should be a safe and potentially rewarding bet. Well written. Same mind think alike! will definitely visit your blog more often! The majority of patients using this oil are seeing massively beneficial effects, including near-complete remission. This medicine is going to change the world, and it's only CBD gummies a matter of time until it is available to every human on the planet. SEMBCORP INDUSTRIES (U96.SI): Is It Worth The Buy Now? Avi-Tech Electronics (CT1.SI) – Is Quick Profit Possible? Koyo International (5OC.SI) - Is It Worth The Risk?